The Old Shop was built in 1842 on land owned by William Craik the local laird of Arbigland . It was first sold to Mr James McKno in 1842 by by Douglas Hamilton Craik of Arbigland Estate. Mr McKno owned it until 1877 when he sold it to William Kennedy who then sold it to James Harris only one year later. Thereafter the house remained in the Harris family for 113 years until it was bought by Jim & Jackie Gibson in 1991. I bought the house in 26th April 2004 from the Gibsons. The Old Shop has been a pub several times, a shop several times and an illegal drinking house! In 1881 it was a pub called The Criffel Inn owned by James Harris who was then aged 57 on the 1881 census. The name Criffel is taken from the big hill visible outside which can be seen for up to 70 miles away being the highest hill in the area. At some time after this it was a grocers shop as can be seen on the blown up photo of the sign above the door in faded letters, taken circa 1900. to the keen eye the letters Criffel Inn can also be seen on the same board underneath the word grocer. Early re-cycling of the piece of wood above the door! 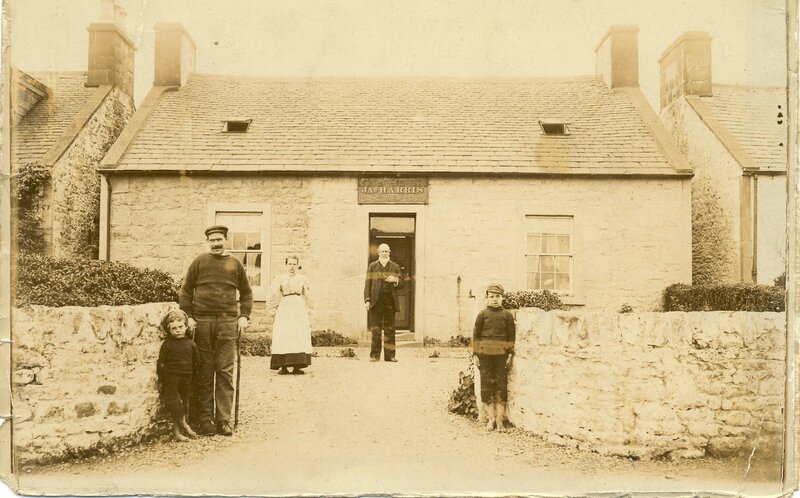 The man with the white beard in front of the door is James Harris and it is believed the other man with the stick is his son and the girl with the white apron is his daughter. There is a figure in the right hand window which is probably Mrs Harris. This photo was kindly given to me by members of the Harris family who owned the house from 1878 until 1991 which is when the late Mrs Jessie Harris died and the house was sold to the Gibson family, who subsequently sold it to myself in 2004. In the 1830’s the wooden jetty was built for the Liverpool Steam Packet Company. The remains of which can still be seen today at the bottom of the garden . 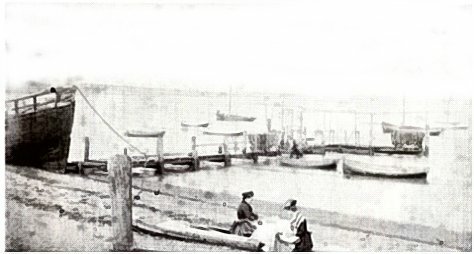 Carsethorn became the port for Dumfries in 1850 but was in use as the outport for Dumfries as early as 1561 and latterly was the embarkation point fro thousands of emigrants in the 19th century. The road to Dumfries was a cobbled causeway laid in 1660 for wagon transport to and from Carsethorn. Carsethorn had a natural deep harbour and several of the houses were built for the purpose of serving the outgoing and incoming trade. 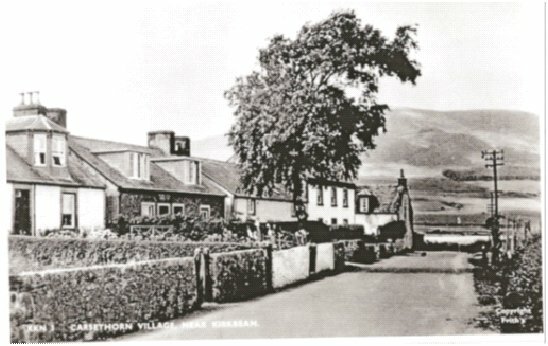 At one time the village had 5 pubs and 3 brothels. 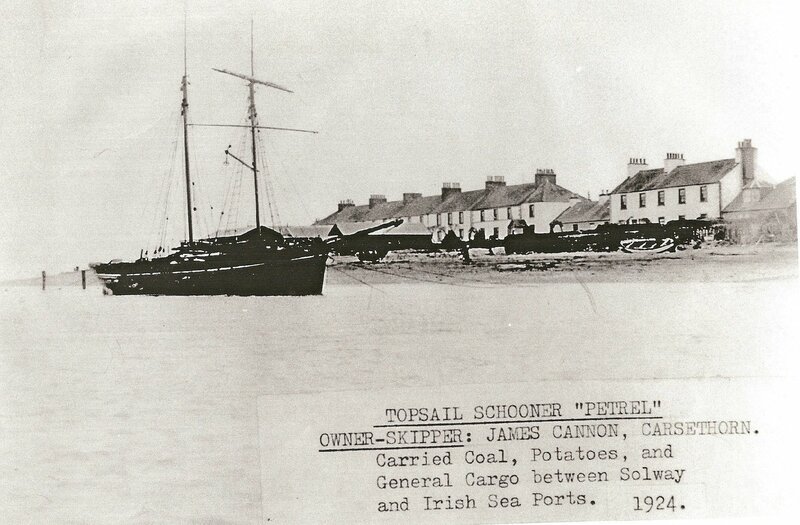 Topsail schooner ‘Petrel’moored at Carsethorn Cattle and oats were exported from Carsethorn and coal was brought from Liverpool. Timber was imported from the Baltic. Coal and lime were imported and lead from Wanlockhead and Leadhills was exported. In the 1690’s records show salmon and eggs going to Liverpool and the same ship the Henrietta of Laghill brought back glass, salt cellars, sugar, tobacco, chamber pots and hops. Many thousands emigrated from Carsethorn to North America, Australia and New Zealand.1851 was a particularly busy year. The entire village of Busy Bit near Dunscore just north of Dumfries left for Sydney in 1872, the schoolmaster, the Blacksmith, Clydesdale horses and all. There is an interpretation board in the garden outside of the Steamboat Inn in Carsethorn which gives reasons of the people leaving for America such as “ for better bread” and for “a better life”. Life must have been pretty grim here then. Where there is legal trade there is always illegal trade and Carsethorn is no exception. There was lots of smuggling along the Solway coastline and it is stated that some of the houses in Carsethorn have cellars which were used to hide the booty. Guess what, we have a cellar downstairs and we used to be a pub so without a doubt our cellar would have many stories to tell if walls could talk!